As an entry into the local Senior Games this week, I have written a short story about our upcoming reunion. Attached is a copy for your enjoyment. Since I won't be able to attend our reunion after all, I wouldn't mind if you made it a part of your online reunion doings so any who might want to can read it as well. I really hate to miss all the fun, but my husband's health is more important right now. Please give everyone my love and best wishes and take lots of photos so I can see everyone. Have a GREAT time! Subject: [Norton AntiSpam] Welcome aboard! Welcome aboard to Clara Glasgow Skipper, who just signed the Leon1959 guestbook and increased our distribution list to 65 classmates! Whoopee! How about finding some more? There are still several hundred out there who either haven't heard about the website or haven't learned how to sign a guestbook yet - if you have a computer-challenged friend, would you please help them sign up? Clara: Thanks for signing the Leon1959 guestbook. I've added you to our distribution for whatever news might be sent out regarding the reunion or whatever. I'll also be changing the color of your name on the Directory page to indicate that we now have your email address. If you know of any other classmates with email that haven't yet signed in, please suggest to them that they join up. The latest addition to the website was the Countdown to the 50th. Check out my entry for June 1955 and see if there's anything you might want to contribute for July, August, or whenever. Everybody Else: I put you on BCC because I've noticed that many of you are getting as far as the 1955 page, but not seeing the June 1955 page. Check it out and give me some ideas for coming months! I'd like to have some neat stuff to say each month from June 1955-June 1959. Or, do nothing and watch it slowly fizzle out ... I don't have that many ideas and my memory of 1955 is faded at best. Photos would be nice also! Anybody got anything from their Cobb graduation -- or was there one? ... LOL .. I don't remember. Thanks for the class of 1959 web site you have done a super job. I have enjoyed it and wish there was something I could contribute. Looked through the missing list and do not know where any of these folks are. Thanks again and look forward to the updates. Subject: Re: [Norton AntiSpam] Welcome aboard! Just keep an eye on the month-by-month countdown and maybe an idea will hit you. I have high hopes for that, hoping that as we progress, others will recall special things that happened during particular months and be willing to send me a note about them. e.g., I sent an email to Monika Wilkenschoff (sp?) in Germany, asking her when she came here as an exchange student. I think that was sort of a biggie for all of us, most of whom hadn't met anyone from outside the USA other than Roger Fernandez. Haven't heard back yet -- I understand she's a professor or something and probably alot busier than I am. all of the other suggestions also. If you're planning to send me photos to put on the website, it will be easier for me if you'll resize them first. If possible, it would also be nice if you can include the names of people in the photos, if you happen to know. The easiest way to keep the photos down to a reasonable size for emailing and including on webpages is to set your camera down to 1 megapixel (or whatever your lowest setting is), if you know how. IF YOU PLAN TO PRODUCE HARD-COPIES FOR YOURSELF, YOU'LL PROBABLY WANT TO USE A HIGHER SETTING THAN 1 MEGAPIXEL. If you take big photos, they can be easily resized for emailing by using a neat Microsoft tool, the Image Resizer. I recently discovered this VERY SIMPLE, FREE Microsoft program that allows you to EASILY resize photos before emailing them, which results in much faster upload time when you send and much faster download time when they're received. What's more, you can do a bunch of them with a single mouse-click! Visit the Microsoft PowerToys page, then scroll down and look on the right side for "Image Resizer." There are a bunch of neat "toys" there, but this one is the one that I wanted most, and wanted to pass along to friends and relatives who continue to email me photos that are over a megabyte each :) After you've downloaded the tool to your computer, you can simply right-click on any photo(s), select (Large - 1024x768), and it creates a COPY that you can email. The original photo is left as-is. Any questions about it, email or call me. Bob, the Countdown is great! Haven't had time to absorb all the research, but being an amateur historian, I love this stuff. I also looked at the suggestions for the 50th again. It is my plan that when it is time, I will check with the school to see if they could accommodate us by letting us use the school for an afternoon or evening. Maybe somebody already knows if other classes have done this at Leon. Anyway, your site should generate some interest & fun. I will pass it along to as many as I can. Thanks for your time & effort. Actually I did retire, from my "day job" as Vice President of a large aerospace corporation. That was in April of 2002. Somewhere along the way I decided, long before I retired from Kaiser, that I needed a "retirement job" and bought a retail operation which has expanded to a multimillion yearly operation in the 20 or so years I have owned it. And on top of that I have had a quarter horse ranch all the time and my brother Bill (class of 1963) and I still have the farm in North Carolina. Sooooooo....... my days are full. I still try to make time for hunting and fishing, and competitive bass fishing is great therapy and a hell of a lot of fun. But like other passtimes, golf, flying, etc., there never seems to be enough time to really devote to it. Maybe what I really need is someone with a very large checkbook to decide that they don't want to retire either and come offload a large store and retail business. But I'm still having fun with it. When it quits being fun, I'll quit!!!! And anyone is invited out to the North State (of California) to visit. We'd love to see everyone. Red Bluff is easy to find and we're in the phone book, no unlisted numbers. Interstate 5 runs right through the middle of it some 130 miles North of Sacramento. We're on the Sacramento River at the very North end of the Sacramento Valley, about 45 minutes South of Lake Shasta or about 2 hours South of the Oregon border. Anyway, I hope everyone has a blast at the reunion and really wish I could get there. My best to all and make sure we have some great pictures to remember it by. From Leon High, drive East (toward Jacksonville) on US 90 (Tennessee Street aka Mahan Drive). Continue East past Capitol Circle to Buck Lake Road, veering right at the new Walmart & Costco complex. Continue on Buck Lake Road through the 4-way stop at Chaires Cross Road. Go straight ahead on Buck Lake Road for one mile & turn right onto Benjamin Chaires Road, then drive about a half mile farther to Shiloh Farms on the right. Part entrance at intersection of State Roads 61 & 267 (approximately 15-17 miles from Capitol Building). From in front of Capitol Building, drive South on Monroe Street. At Paul Russell Road (the old Fair Grounds), turn right one block over to Adams Street & continue South past Capitol Circle, as Adams Street becomes the Crawfordville Highway. Several miles South (near Blue Sink) veer left onto SR 61 & continue (about 10-12 miles) until the stop sign at SR 267. Turn left on SR267 & take next right into the marked entrance to Wakulla State Park. Webmaster Note: I read online that entrance to the park is $4. Not sure if we pay that or not, but you might like to have it ready just in case. If you get lost, call Bob Hoffman at 256-603-2404. BTW, phone number for the lodge is 850-926-0700. For any traveling by RV, they said they have bus parking in their lot and we'd be welcome to park there overnight if we're staying at the lodge. I didn't ask about if we weren't, but I figure it's okay if 100 of our best friends are staying there. I'm either going to camp there Saturday night or maybe scoot over the nearby (I hope) Walmart. I certainly don't feel like driving back to Tallahassee after a night of debauchery ... or whatever occurs at the party. And our 3 doggies can't stay alone, so we're committed to the RV. Do you recognize those two cars? One is a 1959 Oldsmobile and other is 1959 Pontiac, both built by General Motors back in the "olden days." Click either for larger views. Comments made in the year 1959! I'll tell you one thing, if things keep going the way they are, it's going to be impossible to buy a week's groceries for $20.00. Have you seen the new cars coming out next year? It won't be long before $2,000.00 will only buy a used one. If cigarettes keep going up in price, I'm going to quit. A quarter a pack is ridiculous. Did you hear the post office is thinking about charging a dime just to mail a letter? If they raise the minimum wage to $1, nobody will be able to hire outside help at the store. When I first started driving, who would have thought gas would someday cost 29 cents a gallon? Guess we'd be better off leaving the car in the garage. I'm afraid to send my kids to the movies any more.. Ever since they let Clark Gable get by with saying DAMN in GONE WITH THE WIND, it seems every new movie has either HELL or DAMN in it. I read the other day where some scientist thinks it's possible to put a man on the moon by the end of the century. They even have some fellows they call astronauts preparing for it down in Texas. Did you see where some baseball player just signed a contract for $75,000 a year just to play ball? It wouldn't surprise me if someday they'll be making more than the President. I never thought I'd see the day all our kitchen appliances would be electric. They are even making electric typewriters now. It's too bad things are so tough nowadays. I see where a few married women are having to work to make ends meet. It won't be long before they are going to have to hire someone to watch their kids so they can both work. Thank goodness I won't live to see the day when the Government takes half our income in taxes. I sometimes wonder if we are electing the best people to congress. The drive-in restaurant is convenient in nice weather, but I seriously doubt they will ever catch on. There is no sense going to Lincoln or Omaha anymore for a weekend. It costs nearly $15.00 a night to stay in a hotel. No one can afford to be sick anymore. $35 a day in the hospital is too rich for my blood. If they think I'll pay 50 cents for a hair cut, forget it. Webmaster Addition: Isn't it great that Fidel Castro guy was able to overthrow that corrupt Batista government in Cuba? Maybe now those people will be treated better. If you hope to be able to take an active part in conversations at your table on Friday night, you'd better take the time right now to check out the new movie Star Trek now playing at theaters. I predict there will be a lot of speculation on controversial topics like: How does the new Nero timeline affect the future of Star Trek in our lifetimes? How were the two Spocks able to meet in the movie and again on Jimmy Fallon's Late Night show without causing a temporal paradox? Was Spock's mother really caught shop-lifting on Vulcan in her early years? CLICK NERO ABOVE FOR MORE INFO. The other biggie is the American Idol show on Fox on Tuesday nights. The big question will be: Is Adam the new Elvis? If you don't have an opinion on this, you'll probably be the only one. CLICK ADAM ABOVE FOR MORE INFO. RESTRICTED TOPICS: You may be surprised to learn that some of your classmates have grown up Republican and some Democrat. For this reason, if you want to keep your friends and avoid having to "step outside", I'd suggest avoiding the following topics: Bush, Obama Bailout Plan, Weapons of Mass Destruction, Abortion, Gun-Control, and the new Supreme Court nominee. OTHER VIEWING; To really be on top of things, you might want to watch the 24 show on Monday and the Lost Season Finale on Wednesday (concurrent with the American Idol voting results). 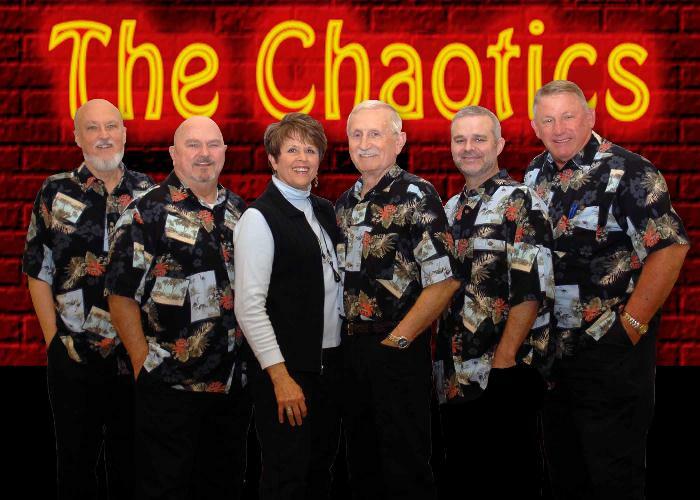 Music by the Chaotics 9:00. More Detail from registration letter: Dress will be casual, 50’s style if you want. A wonderful buffet of fresh seafood prepared on site will be served, including beverage and dessert. If you do not eat seafood please let us know and chicken will be available. Wakulla River boat tour - must be at the dock by 4:00pm, $6 per person, boat leaves at 4:30 pm for cruise which lasts about an hour. More Detail from registration letter: Saturday evening, a wine and beer reception and dinner will be held at the Wakulla Springs Lodge beginning at 5:30 pm. Dress will be “dressy casual”. Wakulla Lodge is holding a block of 20 rooms for us at $105 per night plus tax until April 24. You may make your own reservations by calling 850-926-0700. 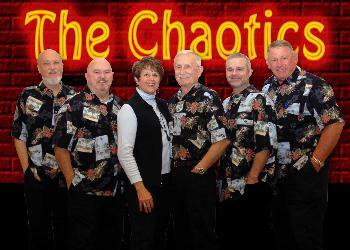 These are The Chaotics (Chaotics.com), who will be playing at our dance on Friday night. Click the photo to see a closeup view. The Leon High School Class of 1959 is celebrating 50 years since that June day of graduation. Many in this '59 class were among those at Leon High who enjoyed the unique advantage of having gone to school with their classmates for six years or more. The few elementary schools in Tallahassee in the mid-1950s fed into the new Cobb Middle School, which funneled into Leon High. It was a tight-knit group. At our first assembly as seniors in the fall of 1958, we heard our class president Robert Parker say the magic words: "Would everyone remain seated while the seniors walk out." The roar went up, and we were now officially seniors. Principal Robert P. Stevens led us through an exciting and productive year. Amos Godby was county superintendent. Home football games were played at Centennial Field. Coach Bill Sexton led the Leon Lions to a 51-0 score at our homecoming that fall. They ended the season with a 6-3-1 record. The band under the direction of Oliver Hobbs entertained at halftimes and represented Florida in the Cherry Blossom festival in Washington, D. C. The chorus under the direction of Harold Chapman had 400 members and returned from the state music festival with a superior rating. There is to be a memorial service at Leon High School at 9 a.m. Saturday, May 16, in the Annex to the cafeteria. Family and friends of our deceased classmates are invited to attend. Judy Goodwin is a member of the Leon High Class of 1959. The plan is to put everything here that we had before the reunion (since I like to save everything). The 50th Reunion page will tell about the reunion, with photos, etc. The Post-50th page will continue on ... to 55th? I'm starting it off with some emails I've received from classmates since the reunion, including the discussions on Mutt & Jeff's Hot Dog Slaw.